If Islam is really a religion of peace and tolerance, how are so many Muslim men and women misunderstanding their religion in exactly the same way? 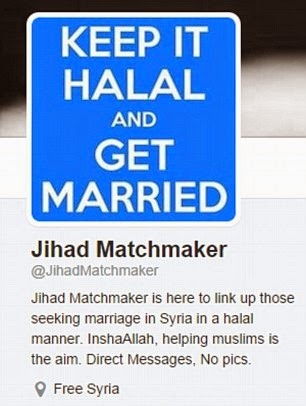 Daily Mail-Eight British schoolgirls have travelled to Syria in the last seven months using a route which has become known as the 'jihadi bride trail' - and hundreds more besotted British women have proposed marriage to extremists online. The true figure is likely to be even higher as the police and families have imposed news blackouts in some cases, prompting fears that Britain's anti-terrorism agencies are losing the battle against the radicalisation of young Muslims on the internet. School friends Shamima Begum, 15, and Kadiza Sultana, 16, and Amira Abase 15, from Bethnal Green Academy are reported to be in Syria after flying out of Gatwick for Turkey earlier this month. A fourth unnamed girl from the same school went out in December. Radical websites like Jihad Matchmaker, which offers to arrange marriages between Muslim women and Jihadists, have been blamed for encouraging young, impressionable girls to travel to Syria. Hundreds of besotted British women have put marriage proposals to jihadists fighting on the front line with Islamic State, according to security sources. One thing I fear is that these girls were abducted and killed by the CIA and Israeli Mossad terrorists, just like they abducted and killed all of the passengers of the airplanes that hit the WTC buildings. The ones that hit the WTC towers were filled with MILITARY GRADE THERMITE! This is what caused for the ample lava of melted metal to be pouring down from the WTC towers before their collapsed. So the real airplanes were taken somewhere else and their people were excuted. And the fake airplanes were the ones that hit the WTC towers. The pentagon was hit by a drone. And the PA field had no airplane found in it. Just empty trenches. Let us pray for the Muslims. Lord Jesus Christ soften their heart and make a way to turn their heart back to you. Please Lord they don't know what they are doing they were deceived by the evil spirit. Only you can change them you are the answer. Amen. The CIA and Mossad terrorists along with their zionist media speak as if you can walk from the US or Europe to Iraq or Syria in a matter of 5 minutes and without any problem. 1- WHERE IS THE CIVILIAN AIRPLANE that supposedly hit the pentagon? The one shown was proven to be a predator drone, and the eye witnesses even confirmed this. 2- Where is the Pennsylvania field airplane? No airplane was ever located there. SO EITHER WE HAVE FICTIONAL CHARACTERS like they tried with JFK in Operation Northwoods, which caused for his assasination for refusing it, or people were abducted and killed by the CIA and Israeli Mossad terrorist organizations. ************ For anyone to just think that three 16-year old girls could just walk from Europe to Syria without any challenge is just a PLAIN STUPID PERSON! 1- As an underage person, YOU COULD NOT even go from one country to another. Customs won't allow you. So let's look through the BS into the facts of the conspiracy of the mentioned organizations. And again, JFK was killed for refusing to play with this. While you've been providing invaluable entertainment so far, it seems you've gone nuts. No, I don't mean this in a funny or insulting fashion but with all seriousness. Your delusions and delirium have peaked and it's time for treatment. Your comments have two sides laughing at you. From the good side: God and everyone else. From the bad side: Your satanic god, his evil prophet, ISIS and all other terrorist factions. If you're evaluated and found to be sane then you need to be treated for treason for betraying the government that protects your huge backside. If you seek protection from your terrorist friends, they will behead you in a jiffy for the lies you've just spewed against them. God will testify against your lies, So will the Devil. See where you're headed? Are you trying to be a Stingy Jack with his lantern? Like I said you need treatment. Medically for your denial and delusions as well as spiritually for your following of an evil prophet and his evil guiding force. Osama, when are you going to join your brothers in isis, whose cause you really do support when kaffir eyes and ears arent watching? Since islam is clearly an antichristian religion, and 100% of Muslims hate us, what part of what isis is doing is unislamic other than giving a negative perception of Islam? The only fault i see from an islamic perspective, is thatvtheir actions are making dawah more challenging for kaffir consumption. Then again, allah is the greatest of deceivers and its he who seals the eyes, ears , and hearts of people. "and 100% of Muslims hate us"
People who vomit excrement like this from their mouths are almost always reflecting their very inner reality. Jay Shawn, you are clearly a stupid bigot. Osama, id say the same about your allah. Your allah has a filthy tongue, but that comes with it being forked. "Osama, id say the same about your allah. Your allah has a filthy tongue, but that comes with it being forked." As to filthy toungue, produce your proof if you're not a liar. One thing for sure though, the GOD Almighty of the Bible did insult disbelievers in the Bible. So with your stupidity, you have insulted the GOD Almighty of the Universe. Your hate is so severe that it is damaging your common sense. Sorry abdulla, i dont recognize allah as god of anything or anyone. I think arab Christians should stop calling god by that filthy name as well. Leave that name for the muslims and the wannabe arabs, islam has created. Btw, what role does allah play in islam? It seems you are more muhammadans than muslims. "Sorry abdulla, i dont recognize allah as god of anything or anyone. I think arab Christians should stop calling god by that filthy name as well. Leave that name for the muslims and the wannabe arabs, islam has created. Btw, what role does allah play in islam? It seems you are more muhammadans than muslims." 2- Yahweh means Ya = O, Huwa = Who is He. 3- The NT calls GOD Almighty Allah. 4- The OT also calls GOD Almighty Allah. 5- The Prophets before Moses, such as Noah and others, have always called GOD Almighty "Allah". 6- Believers had always been called Muslims. This is also where Shalom is derived from. Visit: www.answering-christianity.com/ac.htm to begin to learn something new, because you're currently as good as an atheist. I know things sometime get heated in discussions with Osama, but I wonder if a couple of these responses to him are not counter-productive. God is most certainly not laughing at Osama, and I am not either. AJ Seclon is actually praying for him, which is obviously much more in line with what Jesus would want us to do. Also, I don't think it is ever acceptable to attack someone on the basis of their weight. Dwight L. Moody was a large man, is this somehow a blight on his character too? If you do not believe that Allah exists, then it is perhaps illogical to assert that he is "fork-tongued". I tend to revisit this blog because it engages in intelligent debate rather than in cheap shots. I hope we can continue in that vein. When he is telling us to have a heart attack and die, I don't see any point in having any discussion with him anymore. It is beyond heated, that it has become venomous. Common sense tells us that we might want to stop arguing with him. He is refusing the prayers of some of the Christian brothers here, so perhaps we should respect his wishes and stop praying for him, or at least not tell him if we are indeed doing it. Just like we won't want Muslims praying to their Allah for us. Sometimes it's best to let certain people go their own way. Let me allay your fears, the girls have not been killed, though they are most certainly in danger. As you become increasingly committed to your belief that all Islamic terrorism is a Zionist plot, you are undermining your own arguments Osama. That government agencies in any country may sometimes be complicit in crimes that have been blamed on others is possible, but to suggest that a relatively small group of people might be able to orchestrate such a long standing, complex and unpredictable conflict in multiple countries (in which they also continually kill themselves), is not only improbable, it is impossible. Your assertion requires that the CIA and the Israeli Mossad are all indeed geniuses of the highest order, dedicated to a cause like none other, skilled not only in espionage and acting but also quite willing to become suicide bombers in order to make Muslims look bad. Your assertions can only be correct by elevating the CIA and the Zionist's intelligence and zeal far above Muslims who are, by the millions, supposedly being fooled and deceived by these master minds. I think you realize this, but are prepared to go out on what is hardly even a limb, because the alternative is too painful. I do not believe that you are a member of ISIS Osama, or want to be a member of ISIS. I do not believe that you support their methods, but you do support their aims. That is to bring the world under submission to Islam and institute Shari'a law. You do support their hatred of Jews and their belief that they are an "infestation" as you once called them. That is a lot to share in common with a group that you are trying to distance yourself from, which is why I suspect you so desperately cling to the paradoxical belief that these Muslims are Jews and/or CIA. I too, would want absolutely nothing to do with these people. There are other alternatives that are based on fact rather than supposition, and these are the ones that are being suggested by some here. That is that verses in the Qur'an do support what ISIS is doing and that the example of the prophet Mohammad in which he both killed and condoned killing those he hated, is their legitimate example. Like you, I wish this was not true. I wish that I could conclusively show that killing or enslaving unbelievers was not taught in Islam. I wish that Muslims leaders and scholars could stand up emphatically and show the world through their scriptures that this is not true, but they cannot. Why? Because there are scriptures declaring that it is true! There are Hadiths that declare that it is true! The example of the prophet demonstrates it is true! The writings of the great scholars declare it is true! No amount of wishing, no number of conspiracy theories, no number of revisions can un-write the hundreds of commands and thousands of pages of teaching that blatantly teach and justify violence in order to bring the world under the control of Islam. Ibn Taymiyya, the 14th century Islamic theologian and jurist, stated that anyone who did not engage in jihad against the unbelievers in a physical sense was seen by Allah as "hypocrites and cowards". He said that the purpose of jihad was to "revert in its entirety to Allah" and that whoever "who opposes the realization of this goal will be fought, according the unanimous opinion of Muslims." You are a computer scientist, yes? I would encourage you to think like one regarding your assertions. As always, I look forward to continuing this discussion. @ Osama quote: So the real airplanes were taken somewhere else and their people were excuted. And the fake airplanes were the ones that hit the WTC towers. As for one having worked some time on a AIRPORT, your sound completely nuts. These planes were not some chessnas which could land on the lanes of a highway or simply in the fields of Kentucky out in the middle of nowhere, to pull off such a stunt. So tell us any place in the US where one could pull off any such operation, all the while preventing any communication with Air-traffic control. If these TWO planes had flown so LOW as to escape detection they were to be seen by people on the ground and the planes would need to be flown below clouds. Then after the killings of the passengers, two planes would have either need to be disasembled on the spot or flown away by at least a small crew for each plane. A huge cover up, and nobody would ever step forward? 2015.02.27 (Nangarhar, Afghanistan) - Two children are disassembled by a Fedayeen suicide bomber. 2015.02.26 Nigeria Biu, Nineteen people, including several women, are reduced to pulp by a suicide bomber at a market. 015.02.24 Nigeria Potiskum, Seventeen bus passengers are torn to shreds by a teenaged suicide bomber. 2015.02.24 Afghanistan Logar, Four Taliban suicide bombers slaughter twenty local police officers. Osama you get the idea? these were all Muslims, and EACH CASE of them confirm in my mind that 19 Muslims could get on two planes and have them flown into two towers. Thank you for those thoughtful words. I agree, it is sometimes best to let people go their way when the discussion has become toxic. I was referring more to the nature of the continued debate with Osama, rather than whether or not to continue debate. We may vehemently disagree with Osama and even find some of what he says "venomous", but these are just words. They can do us no harm. The most real part of Osama is the very deep fear that grips him and bleeds into his comments. With regard to praying for Osama, I am perhaps a little short on common sense but I am going to continue to pray for Osama whether he wants me to or not. I have absolutely no problem with Muslims praying for me. Elijah's my example here. Thanks again for your thoughts Keith. Hello, I've been reading this blog for years and I believe that you guys are doing an excellent job on educating everyone who reads the posts and comments here, so thank you for your continuing efforts. May Yahweh bless you and keep you in His care forever, Amen. Your comments would be funny, but being a Christian from Pakistan and having seen first hand the atrocities of Islam I can assure you that no Zionist conspiracies are at work here. By the way, Answeringmuslims.com and AnsweringIslam.com along with Youtube is still blocked in Pakistan since 2012 which was the result of the satirical (yet true) movie made on Muhammad, seems fair? Did I forget to mention that they (Muslims) also burned a church and adjoining houses in the compound in Mardan and tried to burn the Pastor's son alive while the police stood and watched as they screamed Allah-hu-akbar! (Must have been the Jews too, right?) Oh, not just that, but every year there are hundreds of unreported cases of Christian persecution by Muslims acting on the teachings of their prophet. It is so easy for you to sit in the comfort of your home and make up conspiracy theories blaming it all on the Jews while you live in a country that does not condone radical behaviour, but do you ever think about the millions (non-Muslims) living in Islamic countries who fear for their lives and never truly feel free and secure, knowing that they can never openly express their true feelings about this wretched religion because they will be killed? There are a thousand more examples I could give you, but the truth is that you don't really care so whats the point. God bless you for this profoundly sensitive and moving comment. I will keep you in my prayers as you act as a light in the darkness.